Pouch length: 40- 200 mm. W: (Film width) 60-250 mm & 250-350 mm. Total 2.5 KW max. Motor: ¼ - ½ HP. 50 HZ-220 Volts single phase A.C.
With an extensive experience of many years in the industry, we are involved in manufacturing and exporting a wide gamut of Wrapping, Packaging, Sealing and Automatic Machines. Our complete range comprises of Wrapping & Packaging Machines, Collar Type & Sealing Machines and Automatic Machines & Systems.We manufacture these machines in accordance with the standard quality norms and using optimum grade raw material which is sourced from the reliable and authentic vendors of the market. These products are appreciated for their high speed, low power consumption, sturdy construction, dimensional accuracy and resistance to corrosion. We have sound and sophisticated infrastructure that enable us to carry all the business activities conveniently. It is equipped with all the advance machines and technology. 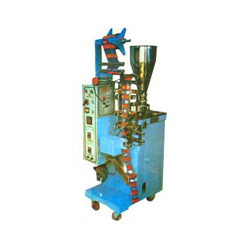 This further helps in flawless production of machines by minimizing the wastage of resources. Besides, we also have well-versed and qualified team of professionals. They are experienced in their respective domain and trained to operate these hi-tech machines. Our clients can avail customized packaging solutions at industry leading prices. Owing to these, we have gained a huge client base across the nation.